Junior forward Aaron Valdes appears to be ready to return to action for the University of Hawai’i basketball team, but whether he does or not remains to be seen. The Warriors will host Long Beach State in a crucial Big West Conference game on Saturday night at the Stan Sheriff Center. Hawai’i, which is on an eight-game winning streak, is 16-2 overall and 5-0 in the Big West, and need a win to keep pace with UC Irvine, which is 6-0. 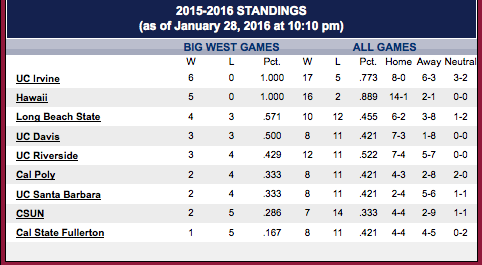 Long Beach State is 10-12 overall and in third place in the Big West at 4-3. The 49ers beat UC Santa Barbara, 80-70 in overtime, on Thursday night, and are scheduled to arrive in Honolulu on Friday afternoon. Valdes, who is averaging 14.8 points and 5.3 rebounds per game, has been sidelined for the last three-plus games with a turf toe injury He started participating in some practice drills late this week, though he has not been officially cleared to play in Saturday’s game. 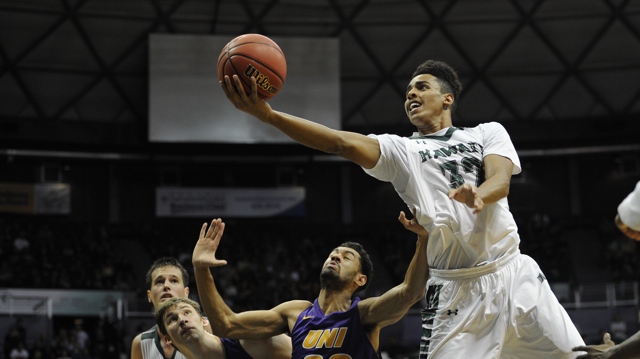 Valdes was injured early in the first half of an eventual Hawai’i victory over UC Santa Barbara on January 9. The Warriors then won three more games with Valdes on the bench with a walking boot on his right foot. What did he learn while watching his teammates from the sidelines? to need him for the BWC tournament. The most important 3 games of the year. in conference MVC. Good for Benjy. Now the Bows, have to keep that train going, to the top, cream rises to the top! ESPN2, would be great game ! Love it if AV could play! Got my tickets! Side note, SE Missouri St didn’t win because of Benjy. It’s probably because they played teams that are worse than them. It would be great to see Valdes suit up but it would be best to avoid further setbacks. He must be hungry after sitting out for the majority of the last 4 games but he doesn’t want to make it worse. Even if he doesn’t play, I like our chances of coming out with the W.
Anyone else see Fleming’s tweets about the student tickets? Honestly, if the Admin felt like they needed to change something, I wouldn’t be surprised. Student attendance has been dismal at best, very disappointing to consider the kind of season UH is having. They should have been rocking the Stan Sheriff for months with the kind of performances being put on. I know if I was a student on campus and my ticket costed all of $5, I’d be there every night! UCSB could not finish off Long Beach but at least they took it to OT so hopefully the Beach will have tired legs tomorrow! UH should try take advantage and push the pace. I’ve gone to every single home game for the past four years, and this year’s student attendance has been on the lower side. There may have been a lot at the last home game, but many of them don’t seem very engaged. A few hundred ‘kriptonite sticks’ were handed out but only less than 50 were being waved around during opponent’s free throws. Very lame. I agree with the school’s decision to limit the amount of free student tickets to around 500. How many do they normally get anyway? 700? Would be nice to see a full rocking Stan Sheriff center! It definitely pumps players up with rowdy crowd behind them! YOU all know I cannot go, homebound, too hard, have to take medical unit to go. So listen to radio at times. or if eyes can see well enough watch video feeds. This taking away seats/tickets at 5 dollars a pop and capping the amount that can go in at that price.. ridiculous…UH admin messing up again.. better to have 50 percent of attendance be students, the peers of the UH BB team thenselves.. then a REAL collegiate environment.. I do not get it.. Oh yeah, now I do, it is UH Manoa, take out your calculator, 500 paying 18-28 dollars or 500 paying 5 dollars..well we will eliminate the 5 dollar a ticket purchasers and if they still want to come, pay more. crazy and unfair again.. money is the bottom line, NOT for the Betterment of the Students , again. ! students just aren’t going to the games! UH sent out the notice to give students a heads up that there will be a limited amount of student tickets BECAUSE DEMAND FOR TICKETS FROM THE PUBLIC IS HIGH. Tavs, not to dwell in the past, but the history on really building the student section started with Gib bringing on Jamie. Gib is the one who started the guys going to the dorms going door to door and Gib himself used to do it as well as make personal phone calls to students. Fotu and Davis became HUGE favorites among the students. They were funny and very engaged with them. It was this group that got built the student section up to over 1000 at one point. The administrative debacle with Fotu and Gib at the forefront, and Davis being a very vocal supporter of his comrades, and then further admin problems with Jamie’s paperwork and Visa…it was like starting all over for Jamie when he finally returned. Maybe worse, because he had to create a positive where a bad taste had been left in the mouth of the students. This IS, first and foremost, their team. You call the student section lame? If you’ve really never missed a home game in four years then you know the best games as far as crowd behavior every year are the “midnite madness” games where it’s general admission and the kids get to sit in the lower bowl. Now THOSE are great crowds!! Louder than the 8000+ in the house the other night by far. I hope Saturday is a great experience for everyone, and most important, for the athletes, and a win for the Warriors! Go Bows! TAVS, props to your stellar attendance! I’m rarely, if ever able to attend the games in person due to job and family responsibilities…however, I haven’t missed a game in years. And I always notice that the student section is severely lacking, especially compared to other schools. The fact that the actual players have to go out and market themselves just to gain attendance from the students…that’s pretty sad. UH has had excellent teams for the last 4-5 years, so why not support? In any case, I’d love to see a sellout this Saturday…if the students don’t want the seats then by all means, sell them to the public! It’s time the team gets a sellout. Let’s GO BOWS!! “We have never turned away a student since we instituted the new student ticketing program in 2010-2011 for any sport. Average student attendance is 255 this year for Men’s Basketball. We went over the 515 once this season – Season opener 671 (and we accommodated all of them). That’s embarrassing, an average student attendance of 255…especially when students admission is FREE. UH Admin is doing the right thing in notifying the students in advance that ticket demand will be high for this game. You’re right, the student turnout for the midnight madness games are always pretty awesome. But that’s about the only game where they come in big numbers. I think the fact that the game is at midnight (or 11pm) and live on ESPN, is a big reason why the come. It’s not really about going to a UH basketball game. It could be any other sport and I think the numbers would be similar. Ha! Thanks! I’ve had to skip classes, leave work early, miss seeing friends and family on Christmas Day… well worth it though! Thanks for that 255 stat. True. I digress anyway. What matters? Fill the house. Make NOISE on D. Play some D from the start, Big west officials call a much looser first half and a ridiculously ticky tack second half. When we’re on a run and the fans are going nuts, RESIST the quick down the court and 3 point shot…but if you’re gonna do it…you better drain it! Dang, I can’t wait! Bring it boys and girls! It is crazy that students don’t go to the basketball games! I rarely go to the baseball and volleyball games, but I don’t think they do theme nights, giveaways, or have student prizes like at the men’s basketball games. Two years ago, UH gave a student an Apple product for having attended the most UH sporting events that year. Nice incentive. The numbers are skewed because hlaf our home games took place during finals and winter break. There are two good arguments on both sides of this matter for the student section. From the UH administration side, the public fans are wanting to buy tickets so tough luck for the students who are not the first 515 in line. The UH administration making it known now that 515 seats is what’s available so 515 is what you get. From the student side, there is NO CAP for who pays the student athletic fees and they all pay the same thing which they advertise as getting you free entry to all the games. This really does not seem fair to have a cap for how many students can show up at games if there is no cap for who pays the fees. If I am student 516 in the line and get turned away I going be super mad because I already paid my athletic fee. Will they supply a partial refund? If my logic is right, it will be impossible for more than 515 students to get in the arena if the game is a sellout. No tickets left to buy, right? Xer21 the excuse of winter brake and finals are BS. N one studies all he way threw they could easily take a 2.5 hour break and support this team! Thats not how it works rob. You havent been in school in a long time, have you? NOT BIG TIME YET.. closest was the Fab Five sellouts during their 2 year run at old Blaisdell, and the 12 sellouts.. and HERE I GO AGAIN.. the Local star part of the success, AC and ALIKA SMITH..they had 12 Sellouts.. that is a lot.. and the Noise was deafening.. your ears were still buzzing.. only time when Chris Herron would knock down some Dagger threes and Fresno would beat the Rainbows.. then the whole 10375(plus the ball wipers. and water girls). would go SILENT>. those were awesome days.. I THINK is it a BWC rule now? NO light sabers waving? maybe..
Anyways.. one day.. maybe in 10 years. if team does well 25 winning seasons in a row, and NCAA 10 consecutive post season dances. UH nationally ranked for 10 years straight, then Upgrade SSC to a legitimate 17000 seat NCAA approved venue for Regional MBB NCAA championship games. that would be BIG TIME>. UH still small time.. however 10000 or 1000 rocking fans.. make a lot of noise, I was part of the 1880 , and 2700, and 3100 that cheered on Larry Little first game, Frank Arnold’s, and Riley Wallaces.. small but loyal vocal crowd.. NO students really just the old, old people fans, who are passed on./ FUN DAYS ! TAVS, the new generation, and KellyO the Pepsi AC generation of fans.. have a great time.. fun MBB is in full swing.. WBB? There is a struggle from coach to players. hope they get it going ! no games were played during finals week. Also, UH has never issues free student tickets during the Diamond Head Classic. Therefore, UH doesn’t keep track of how many students go to those games… they don’t affect the ‘student average attendance’. Although student priced tickets are available for the DHC, they’re available to all university students regardless of university. There were no games during the official finals week, but there were games the week before, which is really when most of the studying haopens, nit to mention when most classes have presentations. I didnt includr the classic. There were still a few games over break. I don’t know if it really matters what the average is for the past games. The students are like the rest of the state and jumping on the bandwagon for this team. It sounds like a lot more students were wanting to come out for this game and thats why they are upset that they are being limited. If UH came out and announced that some corporate company was going to buy out 1,000 seats and only the first 9,000 fans to the arena can get in, I guarantee there would be public outrage and especially if the AD came out and said well, we only been averaging 6,300 fans but we do our best to get everybody in. According to Matlin, this 515 cap has been in effect since 2011. Last year, Jamie Smith actually got the cap raised. I forget what the number was, but the 2011 policy is supposed to be superceded by last year’s developments. Long Beach had to go overtime against UCSB. My thinking is that UH has the edge and is well rested and it might not be that close. I’ll call it a 20 point win for the home team, 84-64. They will turn away students this time. The seats will fill up quickly and when its full there will be no other place for them to sit because it’s sold out. So they better come early. What will be even harder is the 1,000 people that watch the Wahine game right before. Yes it has been a long time since I was taking undergraduate finals, but taking a break to eat or letting your brain chill was very important. Not as important as finding the most quiet part of the library with no distractions! Not to worry…warriors beat 49ers by 20.. Taking a break may be important, but most people dont. there were 4 games over break, and a couple preceding the main midterm weeks and finals weeks. I’m not in any way surprised with the attendance figure.